For a highly efficient front loader washing machine, check out Bosch's WFVC540SUC model. With its high-tech sensors and Energy Star qualification, this unit will help make laundry tasks easy and hassle-free while helping you save on energy and water consumption. Also included in the package is a 72-inch power cord. This unit is also stackable, helping you save on laundry area space. This model offers high-tech and very efficient sensors through its EcoSmart technology. It has an EcoAction option, perfect for reducing energy consumption. Through its ActiveWater feature, this machine can actually turn 13 gallons of water into 400 gallons of washing power. As an Energy Star qualified appliance, this washing machine will help you save on energy and water consumption. 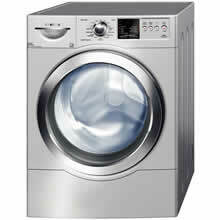 It offers a total of 15 wash cycles, giving you plenty of options when washing different load sizes and types of fabric. The Stain Removal feature can help you get rid of stubborn stains. For cleaner washing water, use the XxtraSanitary feature which can heat up water up to 170 F.
The unit's AVS Anti-Vibration System results into an almost noise-free operation. The product's NSF certification proves that the washing machine can effectively clean clothes and kill 99.9 % of well-known household bacteria. The Allergy Rinse feature completely removes traces of detergent from the clothes. This product includes a 72-inch power cord. Highly efficient, this washing machine can help you save on energy and water consumption. The 15 wash cycles include Quick Full, Wool/Handwash, Drain/Spin, Delicate, BabyCare, Quick Light 20, Comforter, and Jeans. This product is also offered with a two-year warranty. Through its ActiveClean feature, you can expect a better cleaning performance. For a more quieter operation, Bosch's WFVC540SUC includes an AVS Anti-Vibration system. Other advantages of this model are its 1,150 rpm maximum spin speed, variable spin speed options, suds and unbalance sensors, leak protection system, LED screen status indicator, stackability, and 4.4 cubic feet capacity. Certified by the NSF, this washing machine can get rid of 99.9% of well-known household bacteria that can cling to laundry items. With its two-year product warranty, you are assured of the quality and efficiency of the WFVC540SUC model. Some of the disadvantages reported by consumers are missing instructions and manuals from the package, vibration issues, and the expensive price of the model. The cloths come out of this machine VERY damp. A repair person checked it out and said it was spinning properly but the cloths come out wetter than when I washed with my old 35 yr old top loader. Luckily the store is taking it back.